Looking for full mouth dental implants clinic in Mohali & Chandigarh? Because missing or lost tooth is one of the visible irregularities in human dentures that affect facial looks negatively. A dental implant is the best way to fill those irregularities. 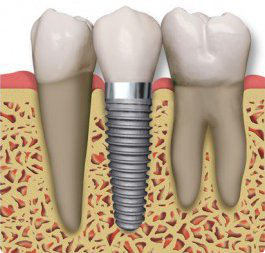 A titanium screw is fixed to the jawbone, which acts like the root of the tooth in this process. Once the screw is installed on the jawbone, a crown is joined to it, which totally looks like the original tooth. Broken or lost tooth not only affects your looks, but it also affects your eating process. It creates instability while biting food and every time you have to re-adjust your position to chew or bite your food. Moreover, it affects the structure of your mouth. Who is eligible for taking the dental implants? A human, who is healthy and wants to have a dental implant, can have it. It is completely safe and successful way to get your teeth into symmetry without much investment. Specialists Dental Care is the best full mouth dental implants clinic in Mohali, Chandigarh and Panchkula where you will be prescribed for a few medical tests that ensure the patient is ready and eligible for taking the dental implant efficiently. • You get your missing tooth back, which is stronger than the old one. • No splitting, sliding, or moving like dentures. • Implants are totally fixed. If you also have a missing tooth or teeth, which is beam affecting your appearance and ability to eat; we can help you at Specialists Dental Care, the best implants clinic in Mohali. Please contact us for more information.